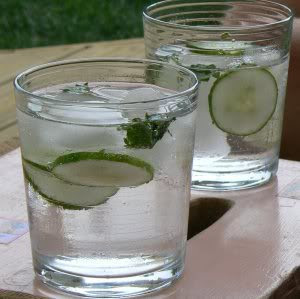 My favorite drink is a gin and tonic with lime - can't get much better - classic and refreshing. My second favorite is a mojito - When I came across this recipe from GQ's top cocktail list I thought it sort of combined both. Very Good! 2 oz Gin of your choice - I prefer Bombay! Muddle cucumber and pinch of salt. Slap the mint. Add rest of ingredients. Let sit for 30 seconds (time allowing). Shake. Strain. Garnish with 1 floating mint leaf and 1 drop rose water on top of leaf, and 3-5 more drops of angostura on the surface of the drink. I know most of you don't keep rose water handy but this is a great summer time drink!